Are you planning for retirement? Creating a college savings plan? Although it is nearly impossible to predict what the market and economy will be like over the years, our savings and retirement calculators can help you estimate how much you need to save to reach your goals. Our free retirement and savings spreadsheets are designed for Microsoft Excel, so you can work with them on your own computer. One unique thing about our 401k and Savings calculators featured below is the ability to select a "random rate" option, which assigns a random interest rate to each year so that you can experiment with how fluctuations in the market might affect your balance over time. Estimate how much of your salary to save to meet your retirement goal. Combines the accumulation (savings) period and the withdrawal period in a single analysis. Estimate the future value your retirement savings. How much will I have saved by the time I retire? Track your balance over time & calculate IRR. How fast will my savings account grow? Set up a simple savings plan to estimate the interest earned in your savings account over time. Create a college savings plan for your children, including costs for K-12 and high-school. Figure out how much you'll need to have saved for retirement. Similar to the annuity calculator, but a bit more flexible and you can enter the amount you want to withdraw. Keep track of how your savings is allocated. Track the progress of your goals. 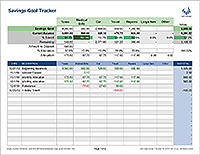 With this spreadsheet you can divide a savings account into virtual sub-accounts for tracking specific goals. Calculate your net worth based on the total of all your assets minus your liabilities. Calculate the difference between Traditional vs. Roth IRA contributions and net worth based on tax rates. 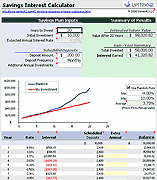 Provides a simple way to track an investment account over time to estimate return on investment. Use this spreadsheet to estimate how long it will take you to reach your short-term and mid-term savings goals, using the snowball method.